€ 0.70 and € 0.78 for petrol (tax free) in the different countries of the EU (1). This new technology is especially interesting for dairy farmers, because they have manure, but almost no heat demand. They do have a relatively high demand of transportation fuel. A farm with 170 cows and 130 young cattle has about 5000 ton of manure. Such a farm is relatively big, approximately two times the average. The average use of diesel is 6,700 liters/year (2). It is expected that there will be enough farms which are two times the means size. 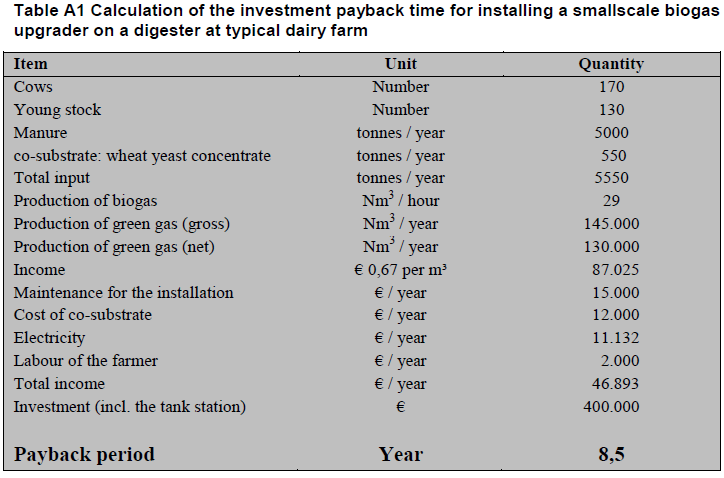 The production of biogas is increased by adding a relatively modest amount of 550 tonnes/year of wheat yeast concentrate. 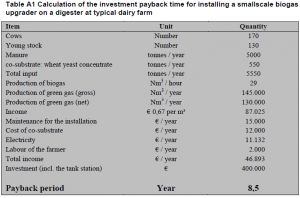 Alternatively manure from a neighboring farmer can be used to increase the biogas production.